Factories that make our clothing are becoming notorious. We read so often about abysmal working conditions, unhappy workers, and terrible accidents. So we went to see firsthand what kind of place would produce Coexist T-Shirts. We needed to be sure it did as well by its workers as it did by its owners. After a flight to Kolkata, we scrambled to find a taxi. Lance and I then met our colleagues others just outside the mill in an industrial area. We were greeted with another delicious curry meal and then brought on a guided tour of the factory. The factory is anything but what we feared. It is an outright lovely, airy, light factory where organic, fairly treated workers turn organic, fairly traded cotton into organic fairly traded clothing. No wonder the workers rarely want to leave. I hope that Coexist will create lots more business for these wonderful people (buy the T shirts!!). 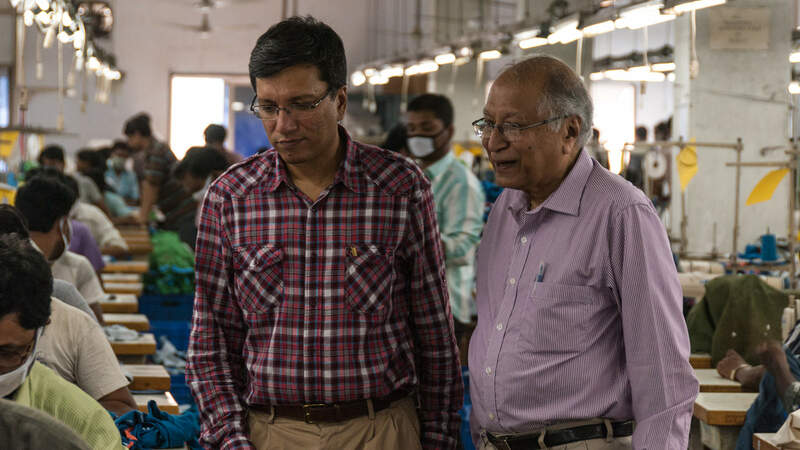 Rajat’s father, Rajindra, founded the mill and makes a charming host. We even get to see the factory printing some of the T-shirts!